Protesters outside the Town Hall before the special electors’ meeting. Picture: Joel Kelly. Guildford resident Andrew Kiely and supporters donned giant ear muffs at the September 22 meeting to signify that councillors were not listening to residents. They requested the City write to Planning Minister John Day, explaining that their decision did not reflect the will of their constituents. Mr Kiely said the council should disregard the vote taken because it did not adequately reflect local residents’ feelings. 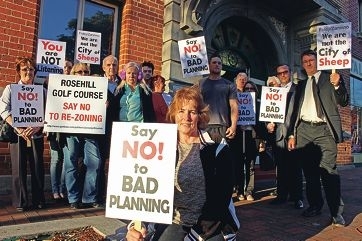 Despite the special meeting being subject to the same conditions as the council meetings, visitors were allowed to record and take photographs at the event at the request of Matt Birney, the representative working for the Save Our Golf Courses group. ‘When you have 4000 electors sign a petition and a solitary developer has a different view, you would normally expect the elected members to support the 4000 electors,’ Mr Birney said. Rosehill Waters general manager Sandra Bransby said she felt it was made abundantly clear at the start of the meeting that the resolution supported by councillors was based on full knowledge and disclosure, on the proper application of planning law and in full consideration of residents’ best interests. ‘But it seemed as if a minority group of residents were not satisfied with a perfectly reasonable council resolution,’ she said. Ms Bransby said ratepayers made obscure references to allegations of misconduct and when Mayor Charlie Zannino tried to call for common sense to prevail, they censured him. ‘The City of Swan’s report on the amendment was exhaustive,’ she said. ‘It encompassed a significantly greater number of issues than any other Metropolitan Region Scheme amendment typically would by a local government authority. ‘We were asked by council officers to provide a considerable amount of additional information, which would not normally be required,’ she said. The City was one of 20 government stakeholders asked by the WA Planning Commission for their input into the re-zoning. ‘Every single one of them supported the proposal in exactly the same way as the City of Swan,’ Ms Bransby said. Peter Bourke, a spokesman for developer Handle Group, said he wanted councillors to be allowed to make a decision without the pressure community activists and residents were placing on the council.